You know we love a good dip around here. This is a version of a dip I have made for years that we always call “lumpy” dip. 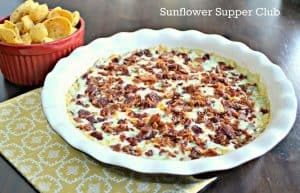 My family thinks it is because if you eat too much of it, you will become “lumpy.” Lumpy Dip basically has all these ingredients, but it isn’t warmed in the oven. I added the little bit of pepper jelly because I love sweet and salty. Hope you enjoy! In a large bowl mix, cream cheese, mayo, sour cream, cheddar cheese, pepper jelly, green onions and pecans. Mix well and place in a dish. I use my pie plate. Sprinkle with cooked bacon. Place in a 350 degree oven and bake for about 20 minutes. I’ve shared this recipe on the easy appetizer blob – hop over at Gooseberry Patch. Check it out for delicious easy appetizers! oh my, I shouldn’t be looking at this when I’ll I’ve had this morning is a cup of coffee. Divine, simply yummy! Can’t wait to make some, possibly tomorrow while everyone is off at school and work. Is that wrong of me that I don’t want to share? Pinned. I love dips and this sounds awesome. I have everything to make it too. SOO glad you shared!